My children and I want to give a sincere "thank you" to all who helped my family, while demonstrating such love for my husband during his life time and of his passing on October 24, 1997. 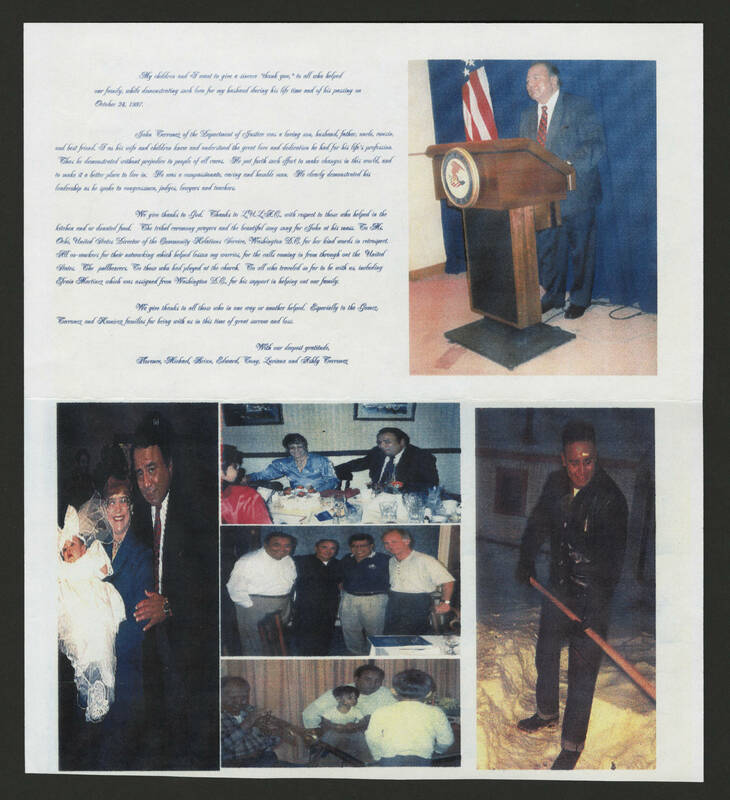 John Terronez of the Department of Justice was a loving son, husband, father, uncle, cousin and best friend. I as his wife and children knew and understood the great love and dedication he had for his life's profession. Thus he demonstrated without prejudice to people of all races. He put forth such effort to make changes in this world, and to make it a better place to live in. He was a compassionate, caring and humble man. He clearly demonstrated his leadership as he spoke to congressmen, judges, lawyers and teachers. We give thanks to God. Thanks in L.U.L.A.C. with respect to those who helped in the kitchen or donated food. The tribal ceremony prayers and the beautiful song sung for John at his mass. To Mrs. Ochi, United States Director of the Community Relations Service, Washington D.C. for her kind words in retrospect. All co-workers for their networking which helped lesson my worries, for the calls coming in from through out the United States. the pallbearers. To those who had played at the church. To all who traveled so far to be with us, including Efrain Martinez which was assigned from Washington D.C. for his support in helping out or family. We give thanks to all those who in one way or another helped. Especially to the Gomez , Terronez and Ramirez families for being with us in this time of great sorrow and loss. With our deepest gratitude, Florence, Michael, Brian, Edward, Tony, Luciana and Ashly Terronez.